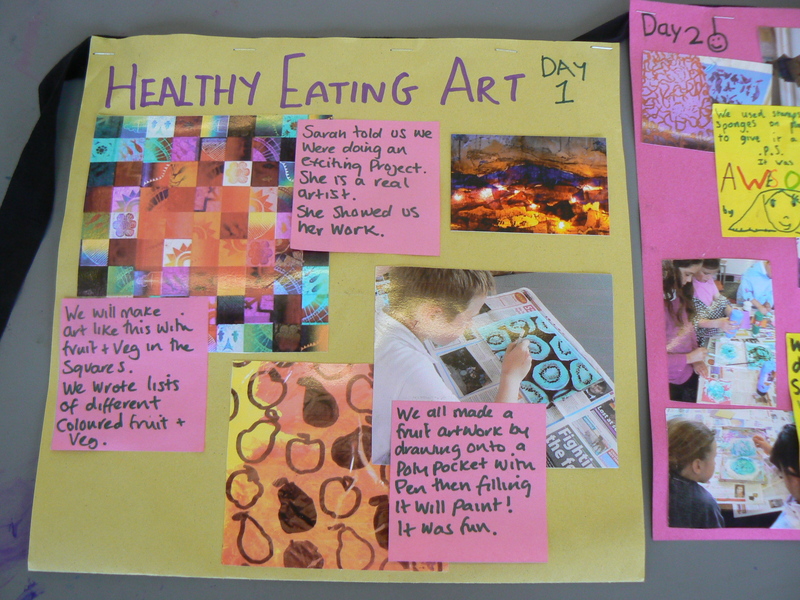 Mission – work with a team from East Milton Primary to create some striking artwork which supports themes of healthy eating. 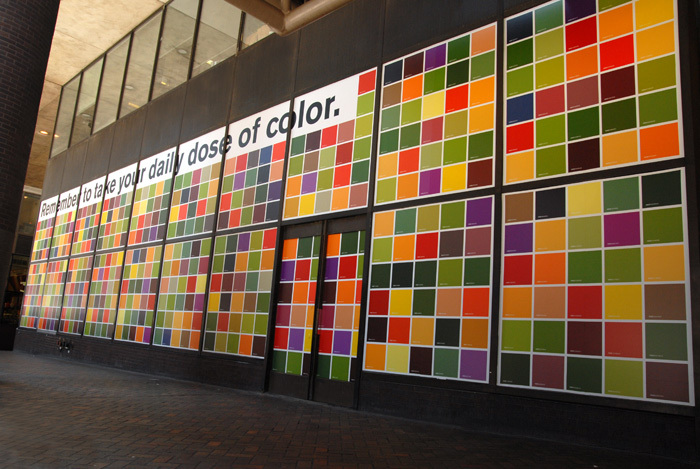 I came across this artwork, each square represents a different food. 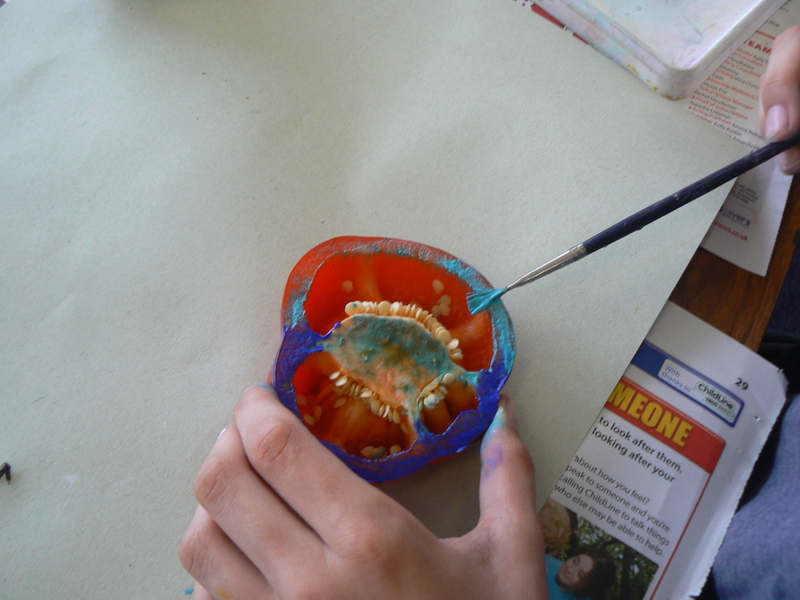 I like the theme “Eat colours”, I think it could work well for this project. 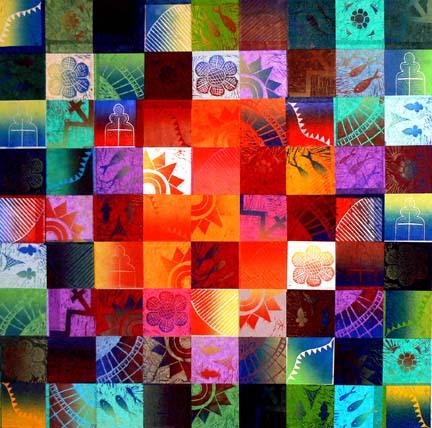 This is an artwork of mine, it is made up of collaged papers made with different printmaking techniques. 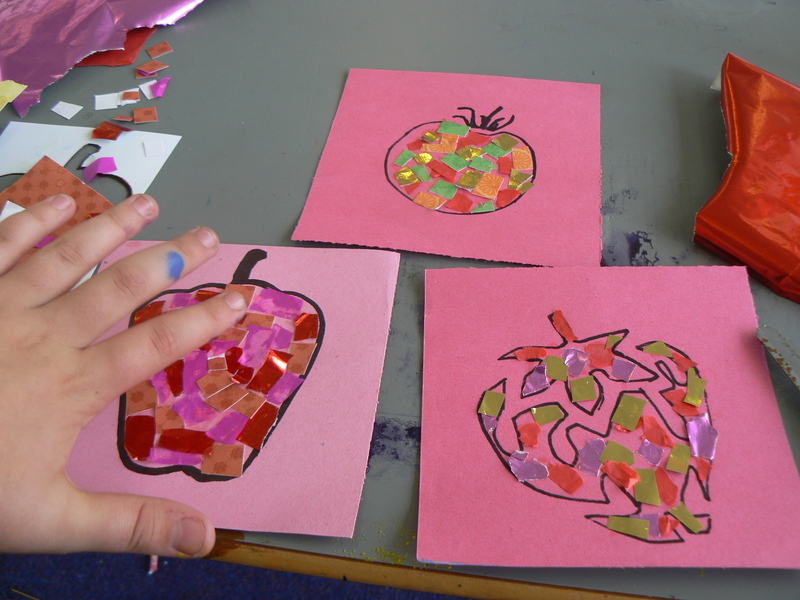 The artwork for East Milton will be made up of lots of squares that feature different healthy foods. 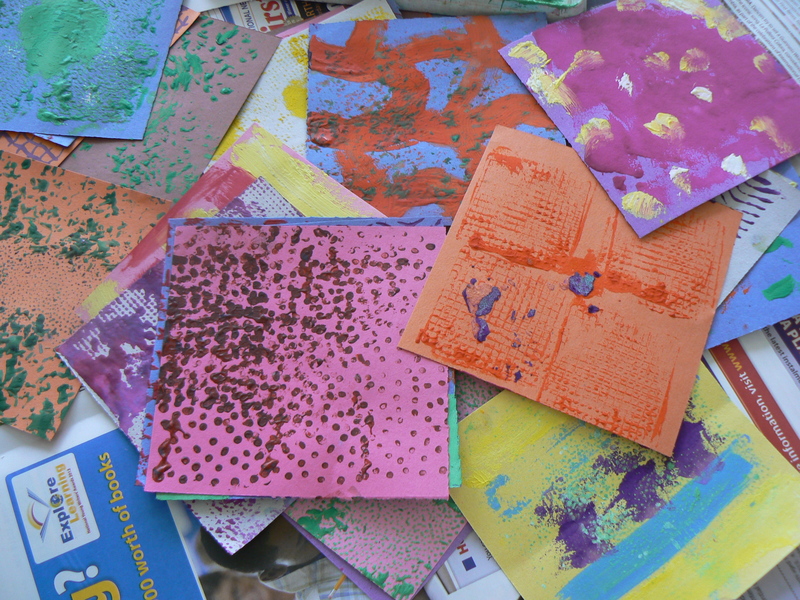 The children will make the squares using techniques each day. 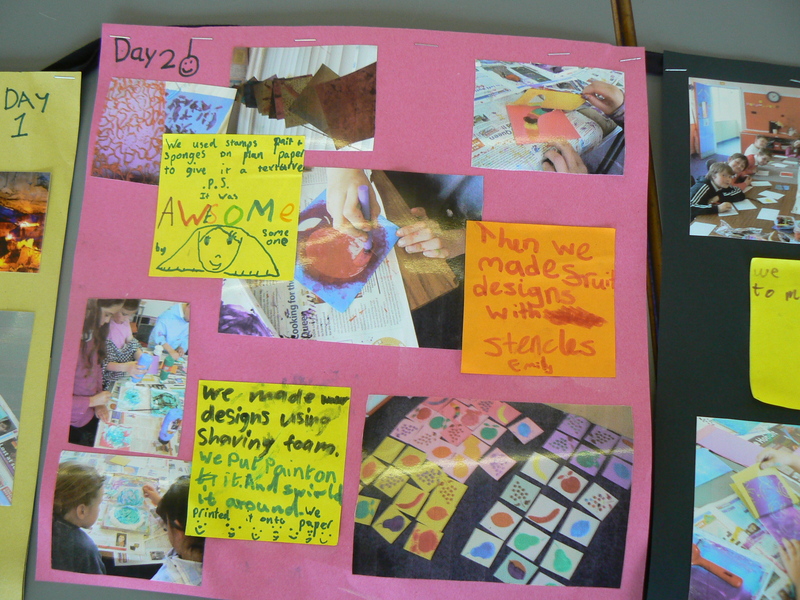 I worked with wonderful children at East Milton for 6 days. 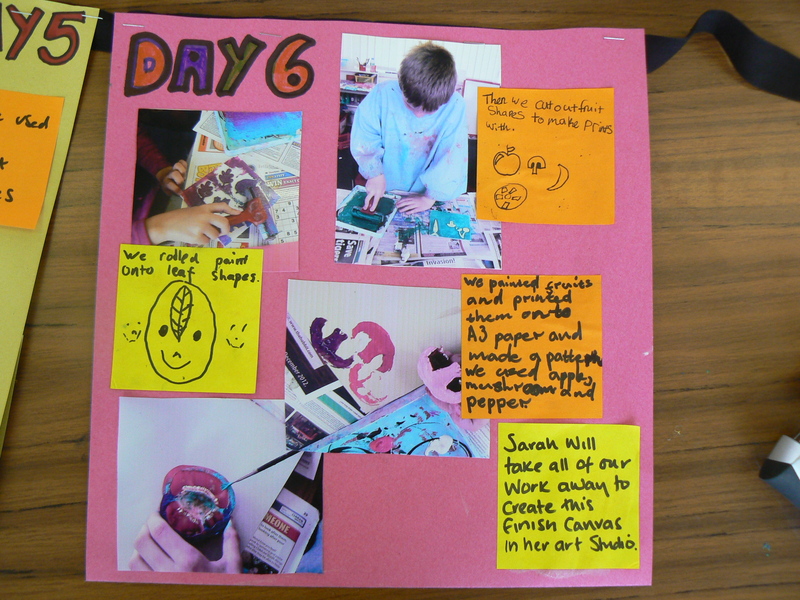 We kept a diary of our activities on each day. 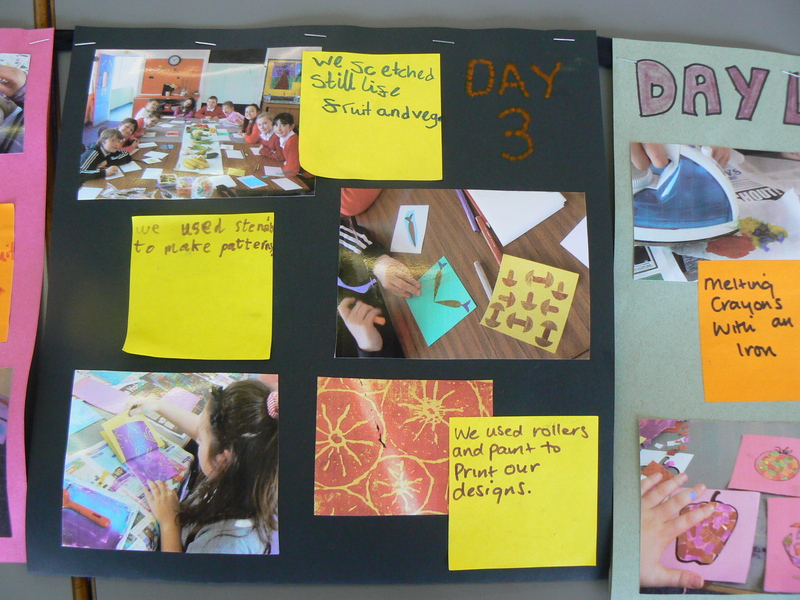 I showed my team of ten my work and we talked about ideas for our project. As a fun introduction to the project we made polypocket squishers. 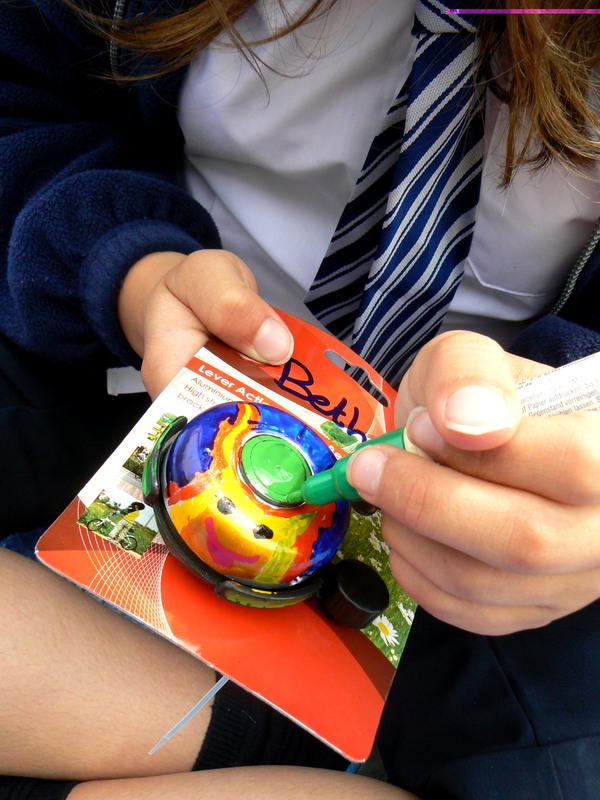 We drew onto a polypocket with a perminent pen and then squeezed some paint inside and sealed the edge with cellotape. 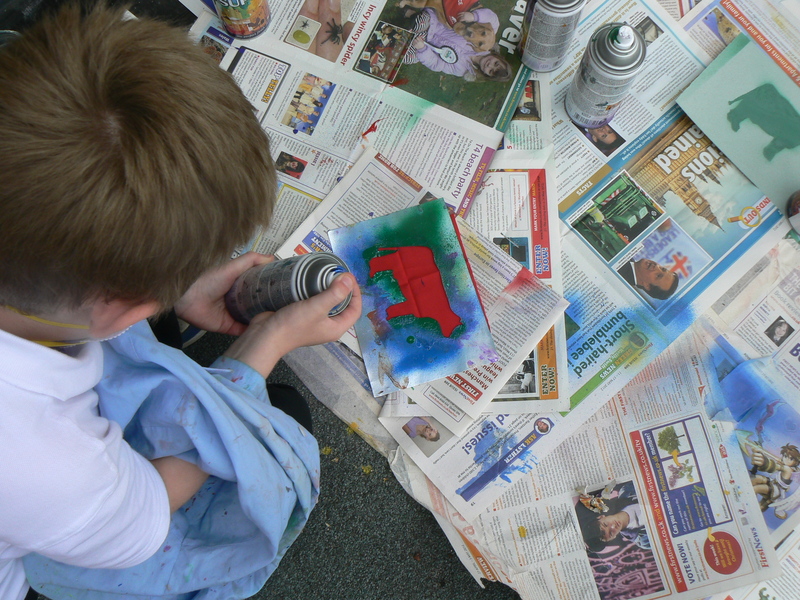 We were then able to spread the paint round inside to colour in our pictures. I taught the team how to stencil, use the correct amount of paint and the correct technique. I was very impressed with their skills. 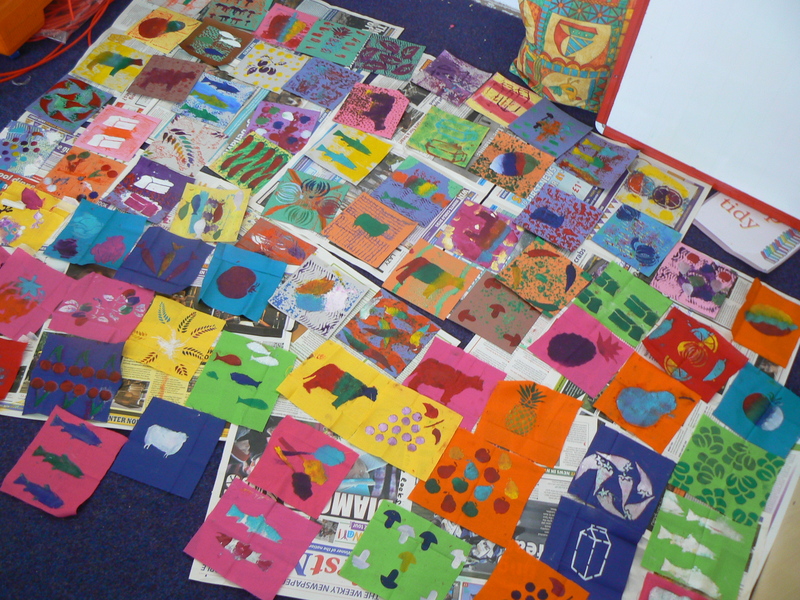 We used stencils to create the first squares for our artwork. 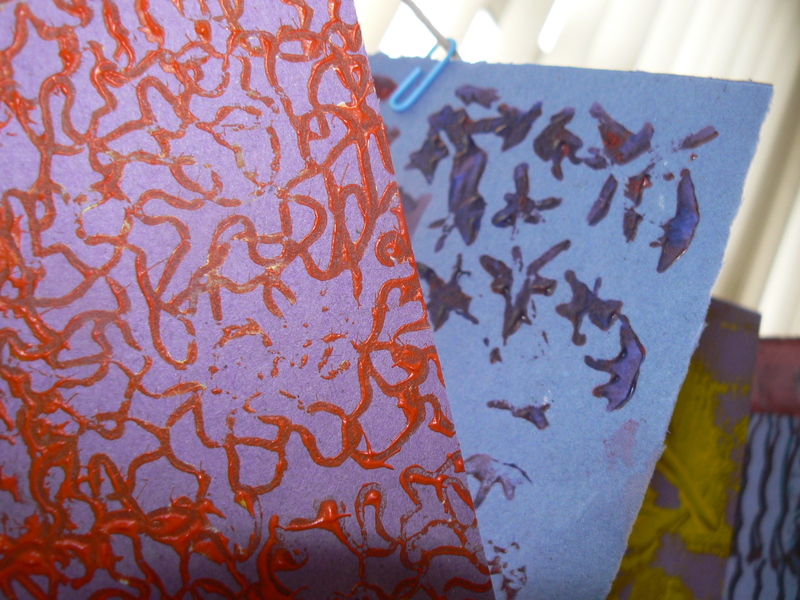 We created some textured papers using stamps that we will use later in the project. 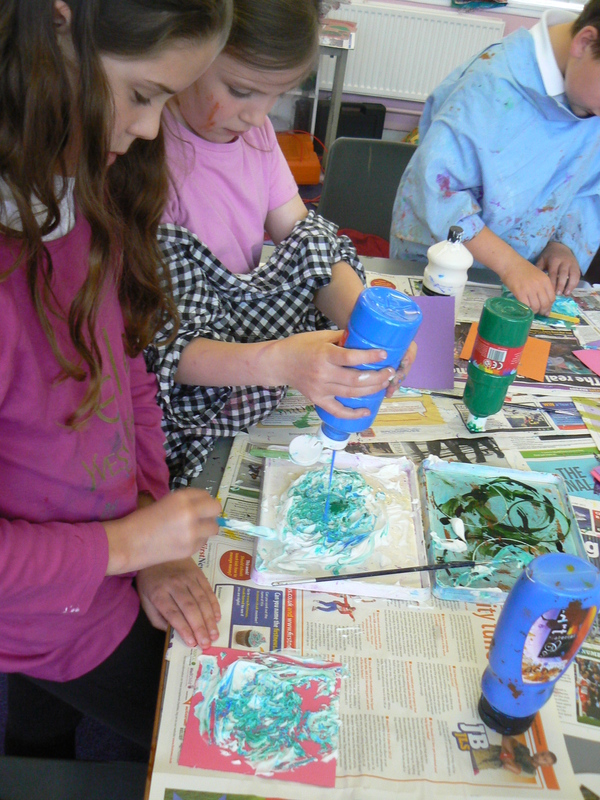 We created water squares for the artwork using shaving foam to print from. 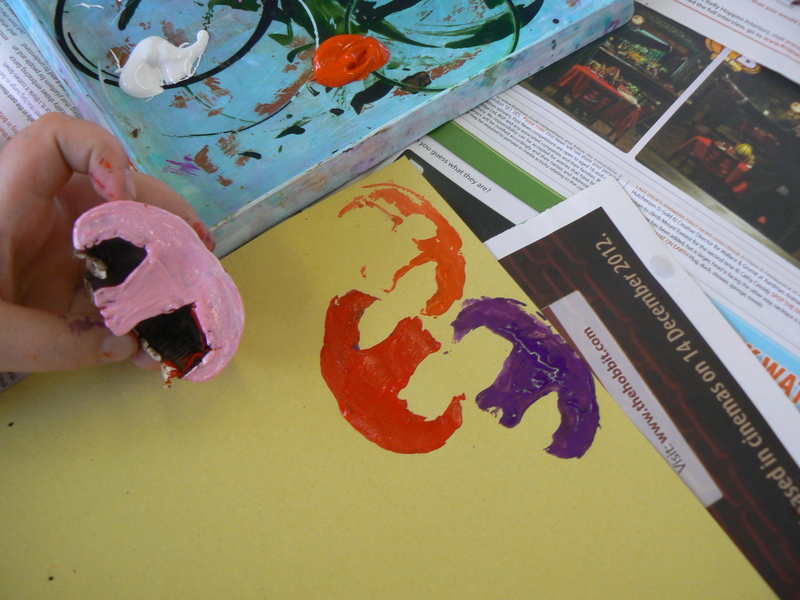 We swirled paint around on top of the foam and then took a print. 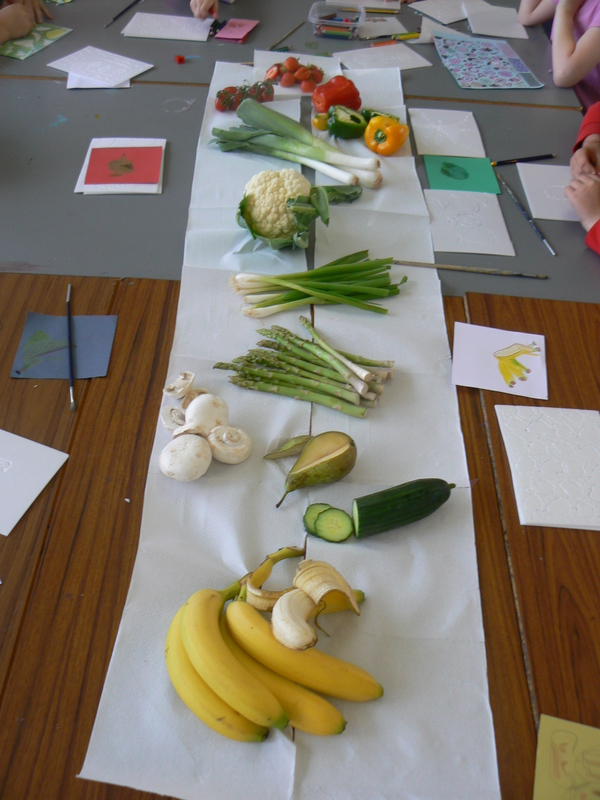 We explored real fruit and veg. We drew it onto paper and onto quick print then printed it with rollers. 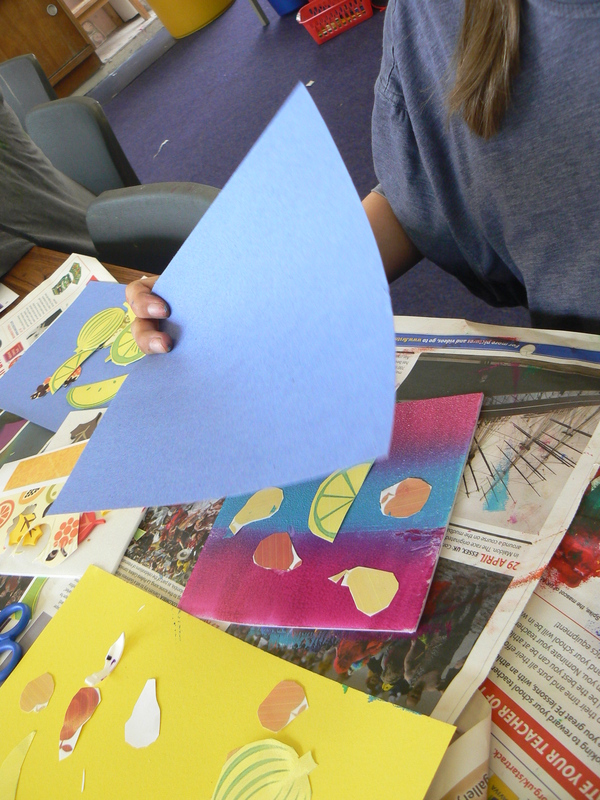 We used small stencils to create squares with patterns on them. 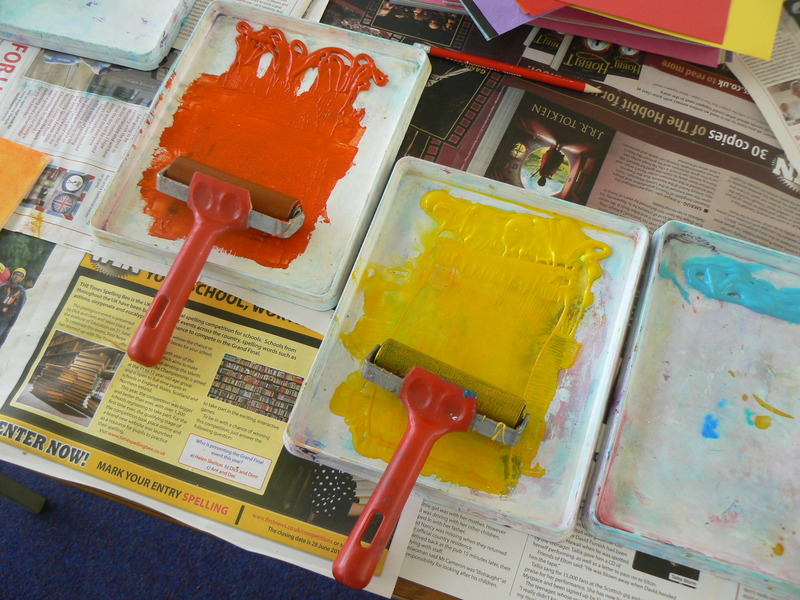 We created more healthy eating squares by melting crayons with an iron. 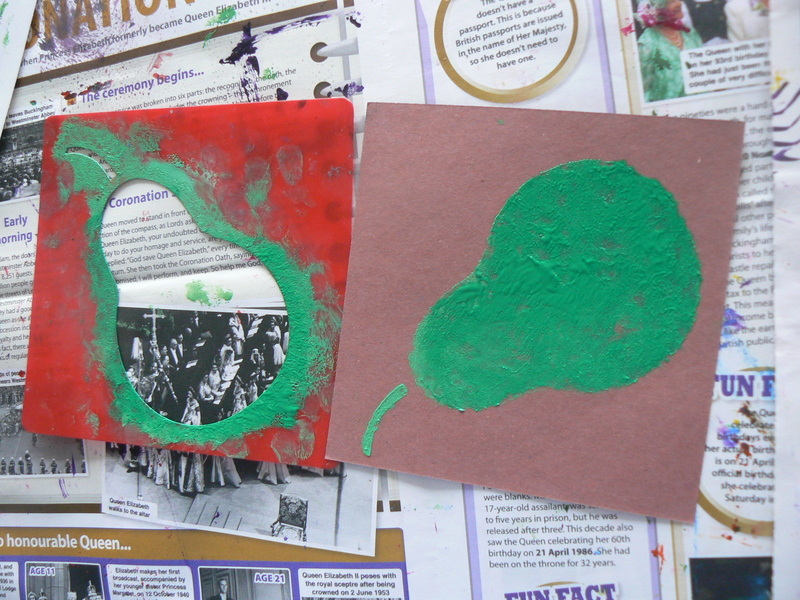 We also made some collage images and used spray paints. 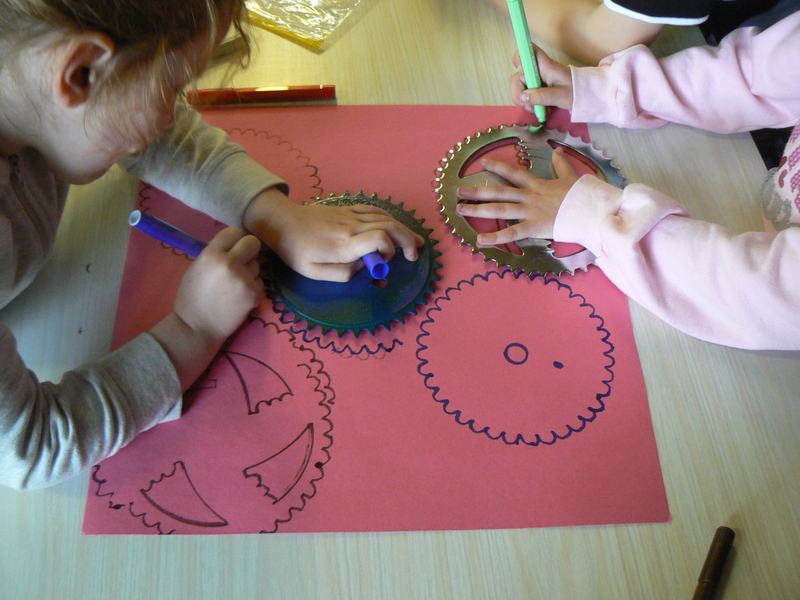 We cut some shapes to make patterns with inked rollers. 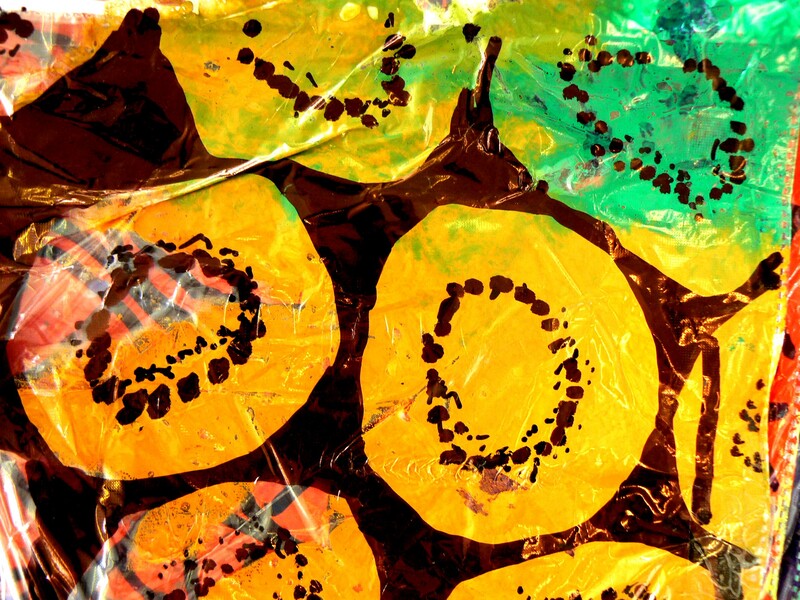 We printed with real fruit and veg. 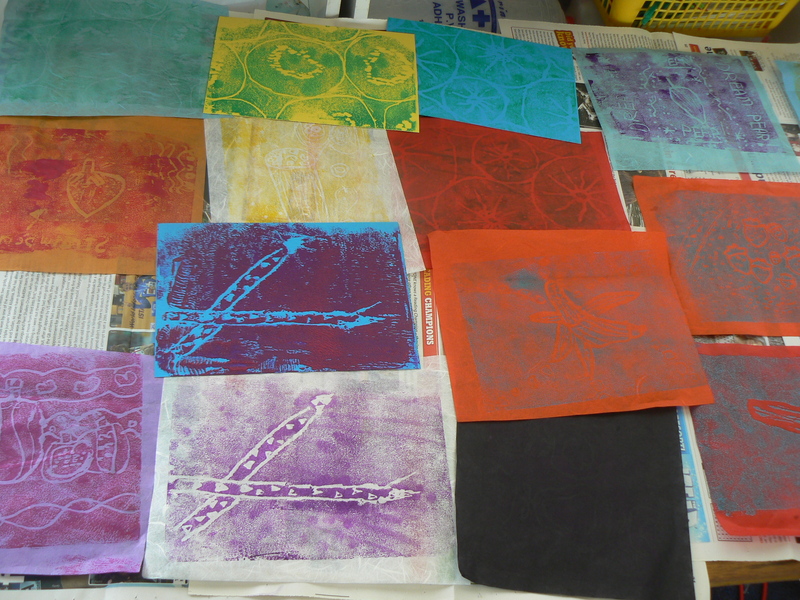 Over all the workshop days we have created lots of different squares using differnt techniques. I will now use these squares to create the final artwork for the school. 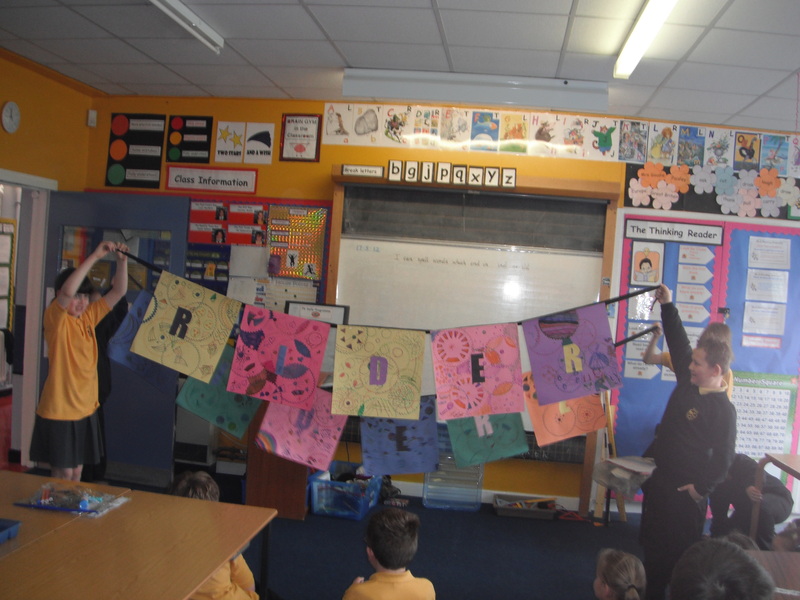 The Riderz Tour is an exciting project supported by cycling Scotland to encourage children to cycle to school. Each day built around a demo of stunt cycling from a team of the best stunt cyclists in the UK. This was the second year I had been asked to be involved. Last year I toured with The Riderz stunt team and delivered an art activity to support the stunt show. 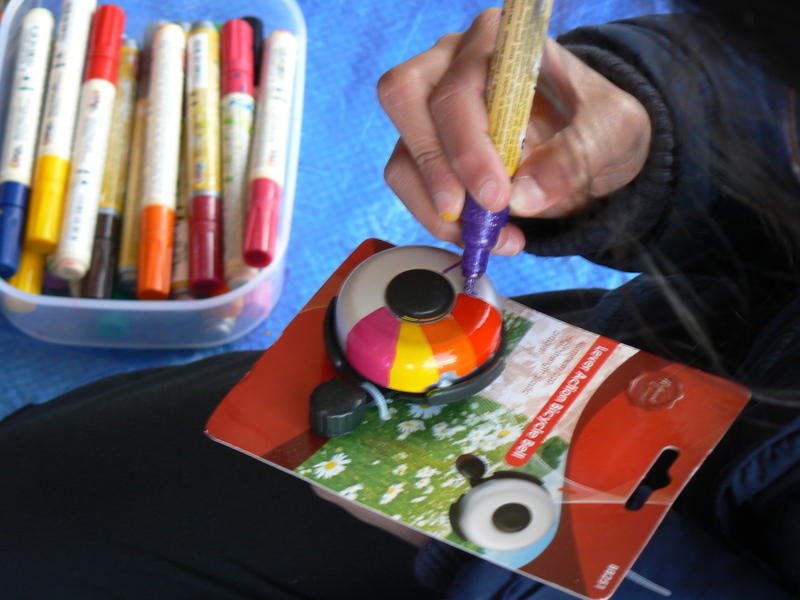 The children were each given a bike bell which I helped them the decorate using paint pens. 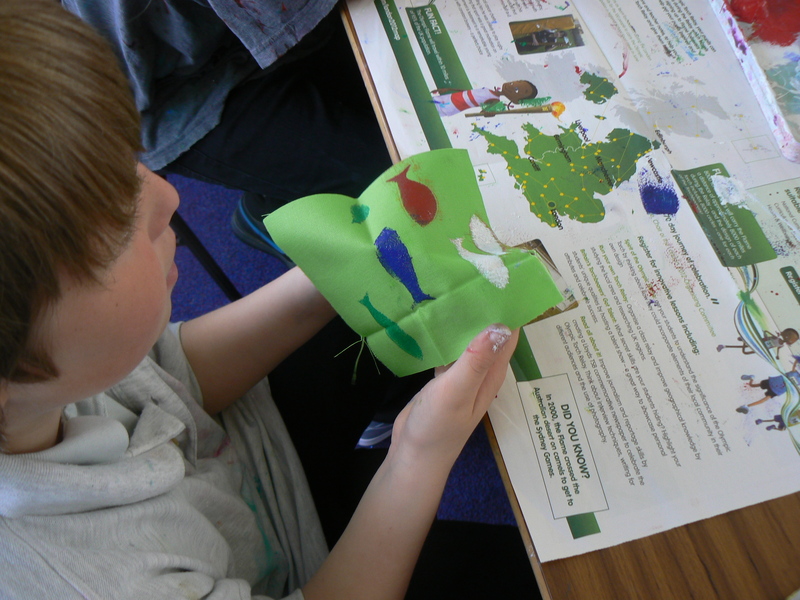 the results were very colourful an individual to each child. At the end of the day the children proudly rode their bike home feeling excited about cycling and proud of their shiny new and unique bike bell. This year the tour was bigger and better. 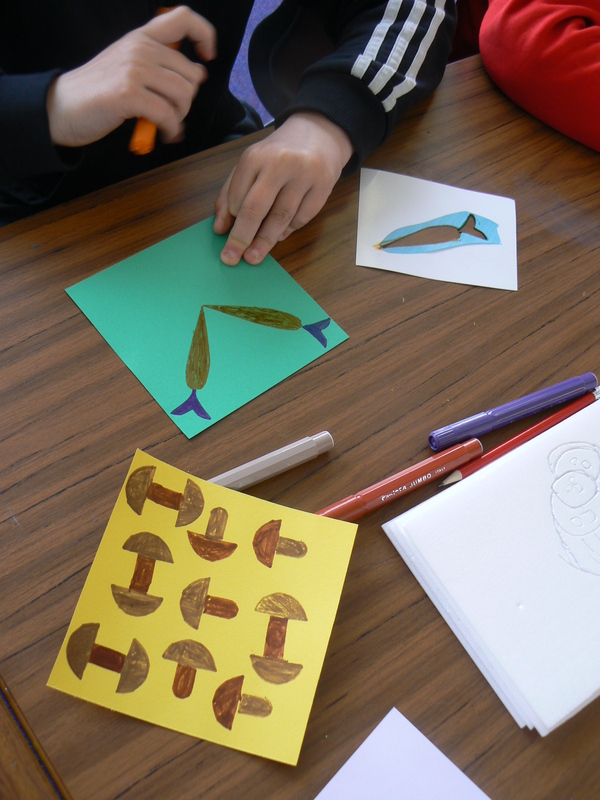 We visited 24 schools over Glasgow, Edinburgh, Moray, Shetland, Fife, Dumfries, Aberdeen and Ayrshire. 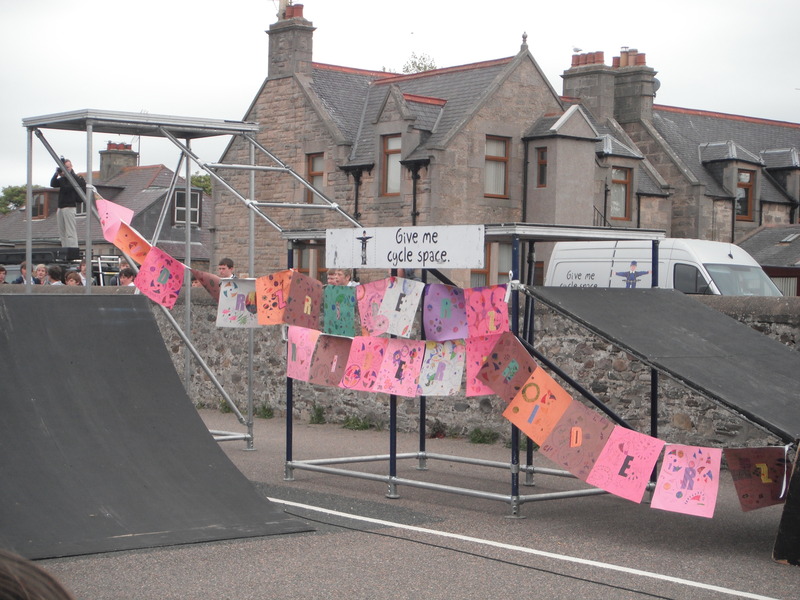 We were delivering the message “Give me cycle space” for cycling Scotland. The campaign asks drivers to give children space on the road so they can cycle to school safely. The schools involved this year got to enjoy the amazing stunt riding from the team as well as an art activity and a music activity to get the children excited and engaged in cycling. 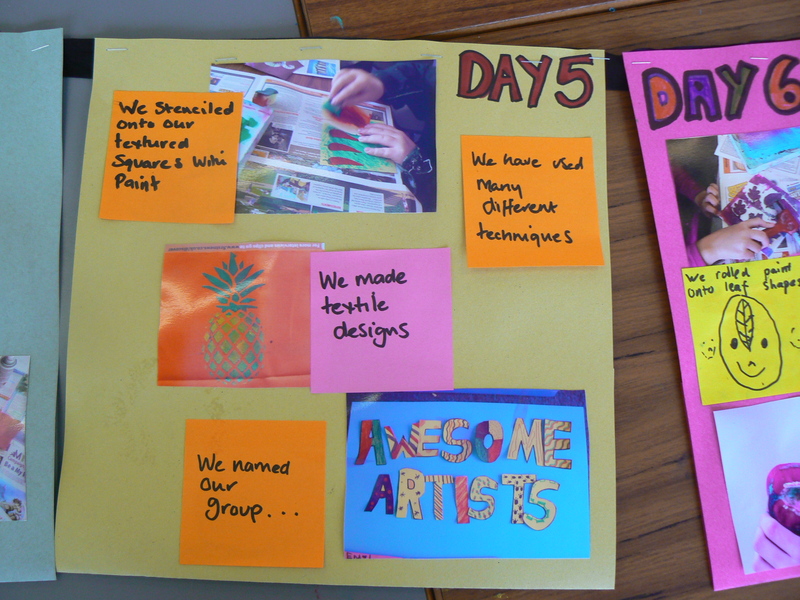 When thinking about my art activity for this years project I had quite a challenging brief…. I would have 45 children for half an hour then another 45 for the next half an hour, that is a lot of children and not much time! The activity needed to have minimal set up as there was a quick turn over half way through. 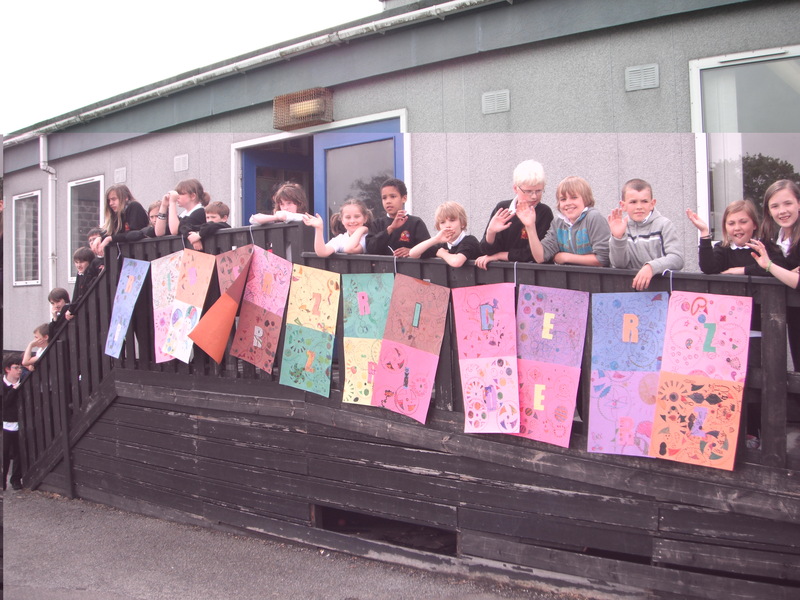 We were visiting 24 school so it needed to be able to be scaled up within a limited budget. 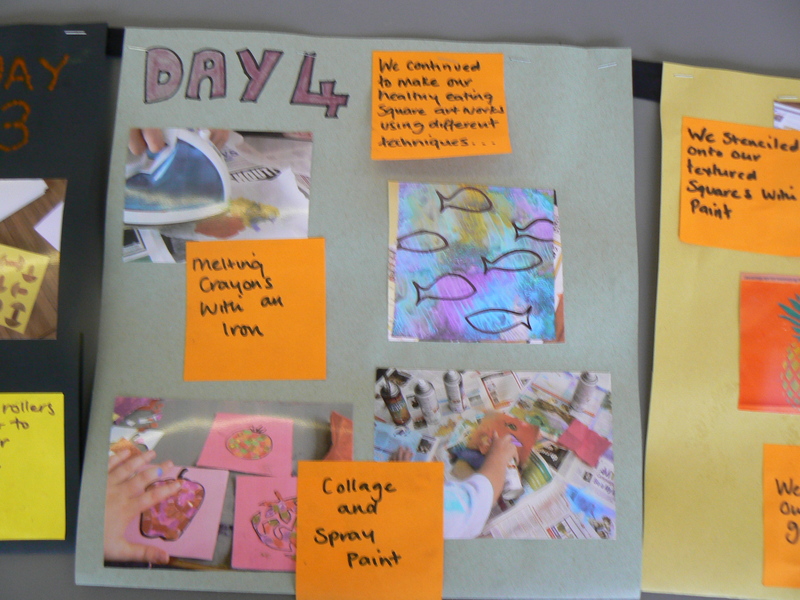 It needed to link in well with the show and the overall aim of the project. 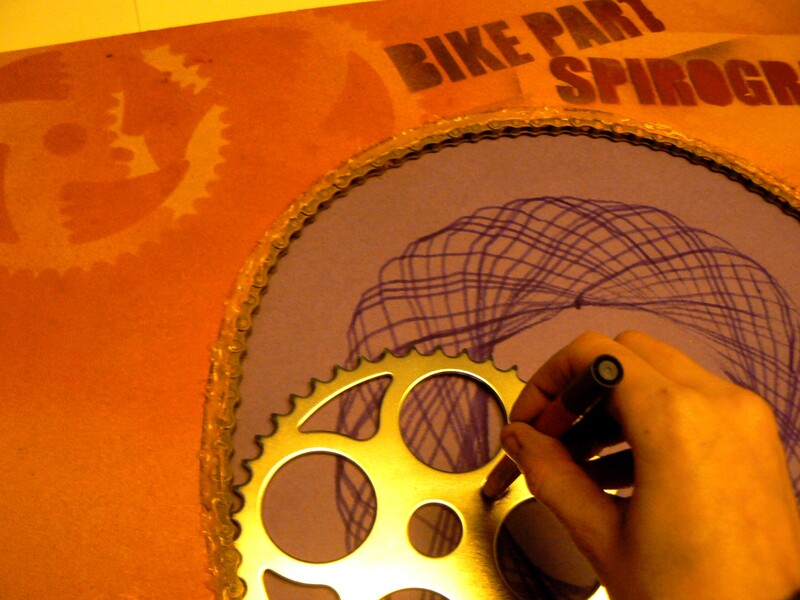 I created some giant spirographs that used bike chains and chain rings. 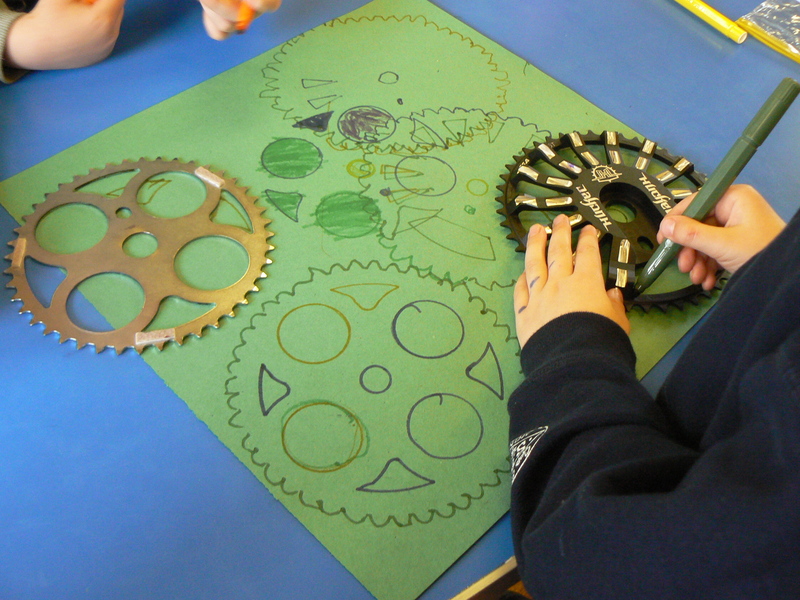 The children could create interesting images using these real bike parts, the images would be used to create a banner which would be used to support the Riderz while they were displaying their skills. After some technical difficulties on the first day (chains coming loose, children too young for activity) I was forced to simplify my activity. I am very glad I did and the new version of the project worked well. 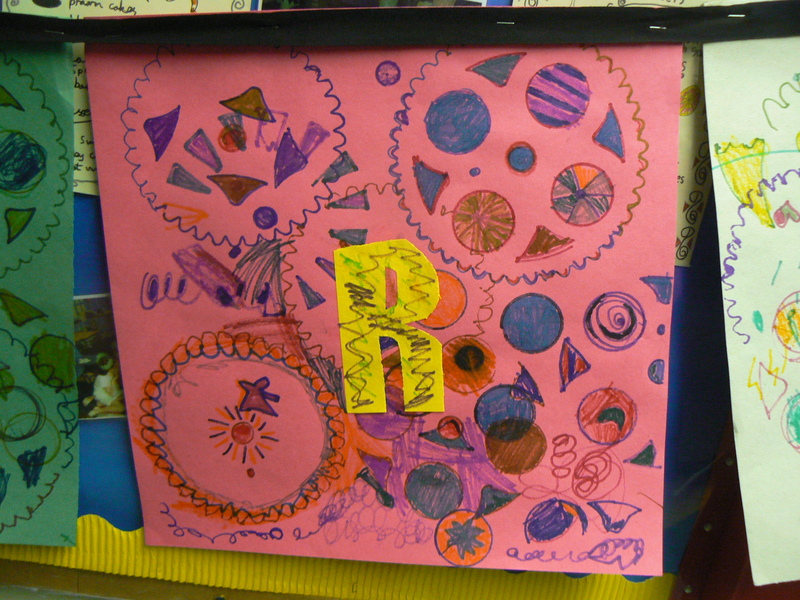 The children still made a banner but used the bike parts as stencils. 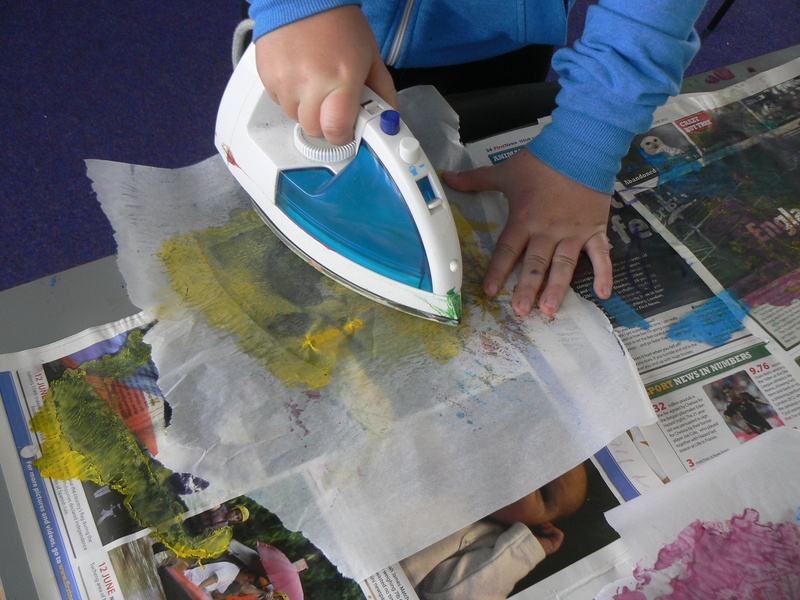 It was very effective, the children loved using unusual materials. Each schools banners were proudly displayed on the stunt rig during the show.